250+ formats, 30X faster speed, zero quality loss, all-in-one video and DVD/Blu-ray solution on Mac (macOS Sierra)! Great job on this software. It's the Ultimate software for video, DVD/Blu-ray conversion and it's an intuitive, attractive interface. But all in all, this is the best swiss army knife converter I've used. A reliable company, great product! Why Choose iMedia Converter for Mac? Want an ultimate multimedia solution for your digital life on Mac? 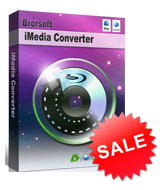 Brorsoft iMedia Converter for Mac is just such an all-in-one multimedia toolkit to aid you in converting videos and DVD/Blu-ray to any format like MOV, AVI, M4V, WMV, MP4, MPEG, and rip Blu-ray/DVD to fit your mobile devices like iPhone, iPad and iPod and more with fast speed and zero quality loss. Besides, you can also effortlessly full disc backup or directly copy main movie from your BD/DVD discs. As a multi-purpose software program, it works as good as a handy Swiss knife. 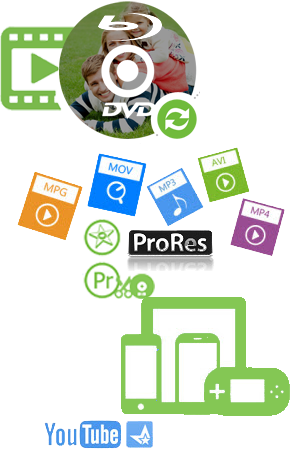 Convert between common video and audio formats like MOV, MP4, AVI, WMV, MKV, FLV, 3GP, VOB, ASF, SWF, DV, MP3, M4A, WAV, M4R, AAC, OGG, AC3 and more. 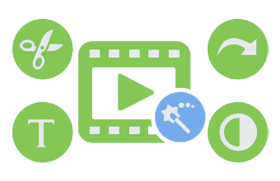 It also adds some advanced encoders like Apple Intermediate Codec, ProRes and DNxHD, allowing you to convert video to seamlessly fit iMovie, iDVD, Final Cut Pro, etc. You can convert video, DVD/Blu-ray video files with optimized settings to fit your iPhone 5S, iPhone 5C, iPhone 5, iPhone 4S, iPhone 4, iPod touch 5, iPad, iPad 4, iPad mini, Apple TV, PSP, Xbox 360, BlackBerry, HTC, Samsung and more. Besides, with the provided web video presets, you can also directly convert video for share on YouTube and more. This fabulous iMedia converter lets you rip any kinds of DVD/Blu-ray without any troubles. It will help you remove all the restrictions of DVD/Blu-ray like CSS, Region, RCE, Sony ARccOS and PuppetLock. Besides, it also offers enough freedom for all movie lovers like you to back up your favorite DVD/Blu-ray movies in a personalized way. Three different copy modes: Main movie, Full Disc Copy and Customized movies are provided to let you copy the exact movie part you want. Far more than a Mac video conversion program, it provides some simple video editing functions, letting you touch up and personalize your video instantly to get the part and effect you want on Mac. - Change video visual effects, adjust brightness, saturation, etc. Runs well on Mac OS X 10.12 macOS Sierra.